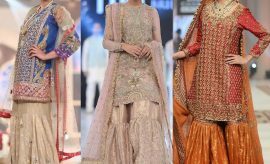 Era of bell bottoms never sees any end, they persistently remained the part of Pakistani fashion over the years. Whether its bells with short tops or loose shirts or even with panel frocks, they are adored for their sheer beauty and smart shape. This year, bell bottoms are back in town with refreshing new designs, rejuvenating our fashion sense to a newer level. Latest of all the designer couture, carry a variety dresses which are tastefully coupled with bell bottom trousers. 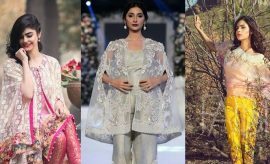 Be it’s the famous Maria.B or the talented Zainab Chottani, their latest apparel collection speaks volume about the elegance of bell bottoms and how they are going look under this signature label. Similarly many other clothing lines are greatly inspired with the trend and launched this particular style with different sets of tops. 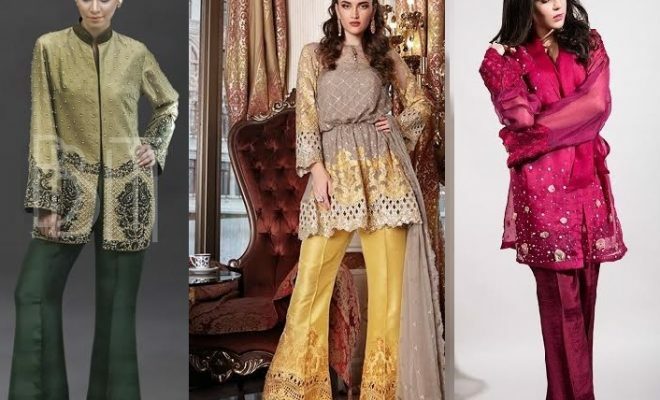 Bell Bottom trousers 2017-2018 designs paired with short and medium length simple shirts, baggy shirts, peplum frocks and capes are all here for you ladies to shine the brightest in the next party or event that you are just going to attend sooner or later. Most of the designs here are decorated with pretty tissue and organza patches along with intricate embroideries. Designed under the label of Zainab Chottani, this particular dress is reflecting the beauty of peplum top enhance by lovely peach bell bottom. 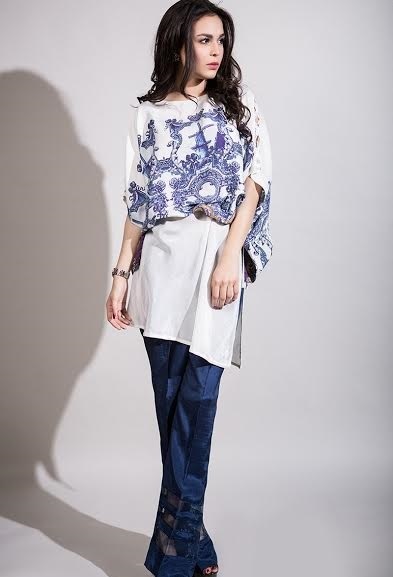 The trouser is kept plain to complement the heavy embroidery of the top. This is a lovely combination of silk with net. It is a perfect evening dress, with prominent white thread work around the neck and the pretty draping net paired with white bell bottom trousers having an embroidered finishing and tissue patch. Full of eastern ethnicity, this dress has everything for a traditional Pakistani event. 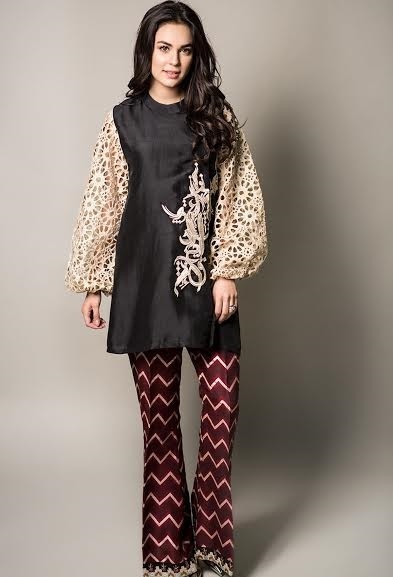 The angarkha top is gracefully spicing the dress, its length is kept short to balance its embroidered bell bottom trouser. The dress is as light as the morning breeze. Its lovely blue fits greatly with the white and the net lace work on the shirt and the lovely bell bottom pant looks incredibly beautiful. This dress is one heavy dose of embroideries with intricate thread work all over the dress. What makes this dress worth loving is the amazing combination of teal with bronze. And its coat shirt is perfect for the trouser. It’s a short length peplum top with monochromatic bell bottom trouser. The dress is embellished with pretty embroidery in ivory and gold. 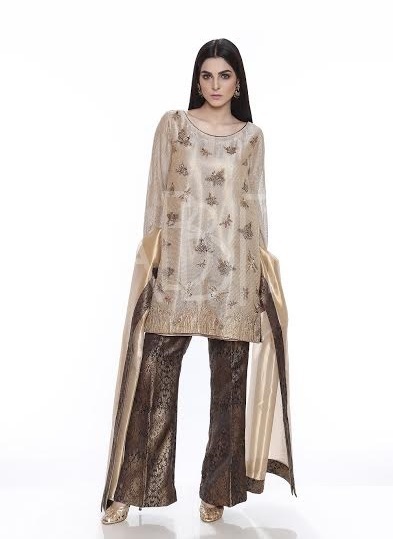 This beige jacket is nicely complementing the trouser due to its medium length, waist belt and embroidered front. Embroidery in teal and bronze is looking amazing on this organza jacket. 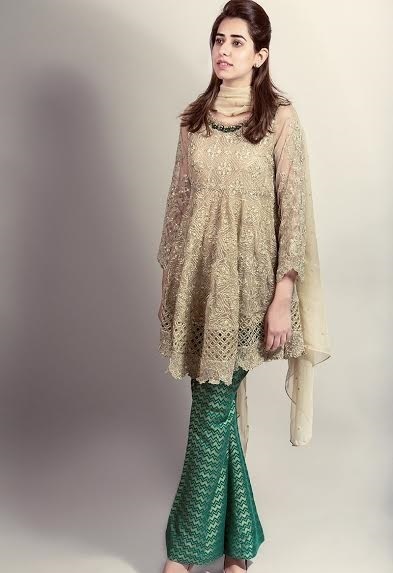 This bell bottoms dress is an alluring blend of gold with green. The top style might take you back in the past where bell bottoms were fondly carried with short tops in that front slit style. Here is a great treat in velvet for you. This maroon is going to steal the praise for you. It’s all plain and simple except that pretty white embellishment over the shirt. The prominent feature of this glam dress is its border printed bell bottom trouser, creating a contrast of white with red floral pattern. Same floral patterns are embroidered over the top with sheer elegance. Another marvel in organza that will mesmerize you for its pretty embroideries and lace work. The trouser with it is crafted in simple self-embossed print in shades of lovely fawn. Ethereal floral is bringing you the pure desi outlook. 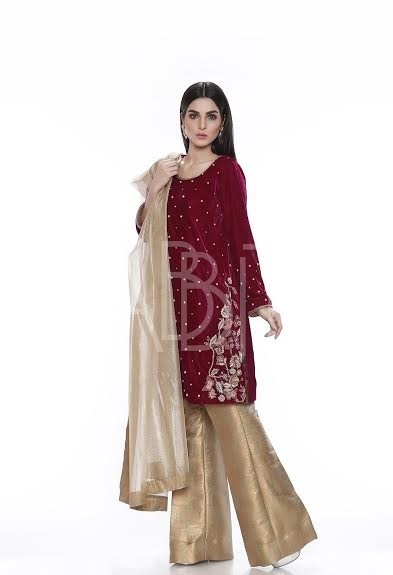 Pretty gold dupatta in organza, velvety maroon top with glaring bell bottom trouser will surely be making you crazy after. You can carry such outfits to wedding events. Gold dust has a simple basic style with round necked medium length shirt and a trouser. But its mild embroideries and prominent trouser is making it look extra ordinary and exquisite. This dress is going to spice up your entire outlook with its sparklet red. Moreover the dash of gold embroidery is literally adding fuel to the fire. Its color scheme is enough to make you catch your gaze. While the lovely top with belt and embroideries over the bottom is magnificent. The inner ombre shirt with coffee peplum top is a wonderful fusion of both the hues. The classic lace work plus the thread work over the trouser is simple amazing. Organza in pink looks a hundred times more alluring. Silk collars and that belt is paired with the bottom. Baggy sleeves are back again. These sleeves are paired here with a silk black embroidered top. Its embroidery has some calligraphic text highlighting its Arabic touch. Beige with green is absolute beauty. The entire dress is finely embroidered with cut work covering it from neck to border. However the trouser is made out of silk printed jamawar. Perfect for evening parties, this suit is combo of pretty white and alluring blues. The shirt is all in white with printed upper half. Sleeves are fused into the shirt. These pretty and chic bell bottom trousers stitched in latest styles and designs can be purchased from the relevant brands and designer labels that they belong to. The best thing about these dresses paired with bell bottom paints is that these can be replicated on the fabric of your own choice. So you may have a closer look once again, and look classy this year by wearing trendy designer bell bottoms. Leave your worthy feedback into the following comment section. Stay connected with Stylesglamour Party wear Section for more party wear fashion updates and style trends alerts.